Our double rooms are all very large and airy, with stunning sea-views over Panteli Bay. Relax on your own private balcony and enjoy the evening breeze with a glass of wine. Our studios are very large with plenty of natural light. There is a fully equipped kitchenette, and a large private balcony with magnificent sea views with plenty of space for outside dining. Perfect family accommodation our apartments have a fully equipped kitchen, large open plan rooms and private balcony with plenty of space for a great family meal overlooking Panteli Bay. Asterias makes a great base to explore the undiscovered and beautiful island of Leros, and with our local knowledge of island life we can help make your stay interesting, relaxing and full of great memories. 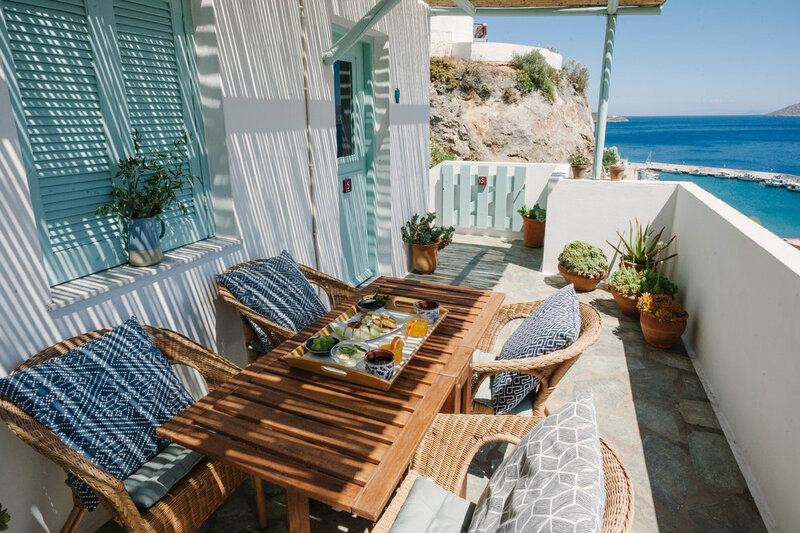 Why not have your Breakfast served while you relax on your balcony? We like to use fresh, homemade local products and charge an additional €8 per person. The menu changes daily, and includes fresh bread from our local bakers, fresh fruit, home made cakes and pies, Greek yoghurt, local honey, freshly squeezed orange juice and tea & coffee. Please let us know if you would like breakfast when making your booking. We're only 100 meters from Panteli beach, down a private staircase, where you can enjoy a relaxing swim in the Aegean only 2 minutes walk from your apartment. Panteli is known for its stylish cafe-bars and excellent tavernas - and in the evening you can dine right at the waters edge with a stunning backdrop of the windmills and the castle beyond. We discovered Leros purely by chance, after missing our ferry we decided to take a gamble on the next available boat that evening and seeing where it would take us. Over ten years later, when we first spoke about moving to a Greek island.. Leros was the first place on our list. Just fill in our enquiry form and we'll get straight back to you. Why not get all of our news and special offers straight to your inbox?